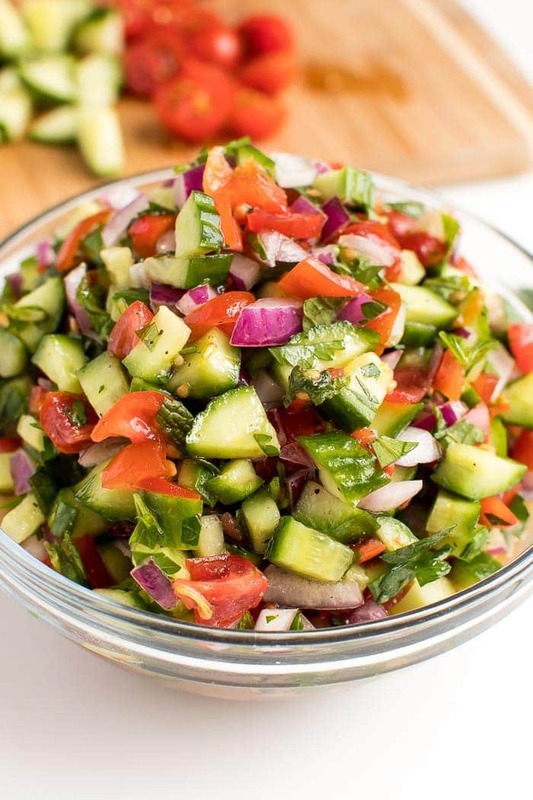 Bring Middle Eastern flavors into your home with this simple Israeli salad. Made with just five ingredients (six if you want to add in peppers! 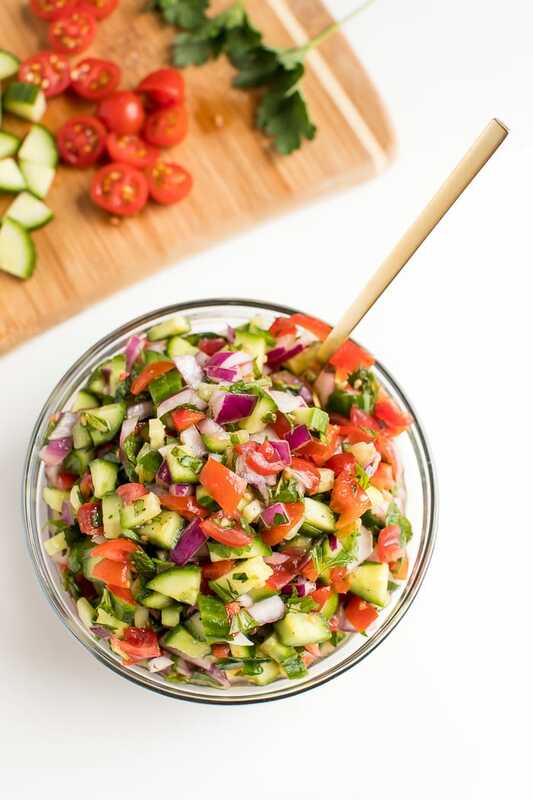 ), this herby tomato cucumber side salad is the perfect pairing for the protein of your choice. I am in full out salad mode. Not that I don’t #saladeveryday year round, but during the summer months I go even more crazy with salads! The warm weather leaves me craving light, fresh meals and all the ripe, summer produce makes salads taste even more delicious than usual. We have a cherry tomato plant in our backyard and as soon as it starts producing I know I’ll be making this salad again! 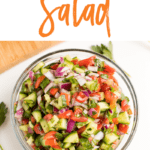 This recipe is inspired by both my love of salads but also our trip to Israel last year. I don’t know if you’ve noticed, but so much food inspo came out of that trip! 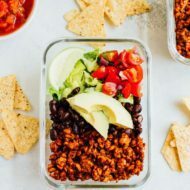 My favorite meals lately have been the quick and easy ones that are still loaded with flavor. Aka this Israeli salad in a nutshell. 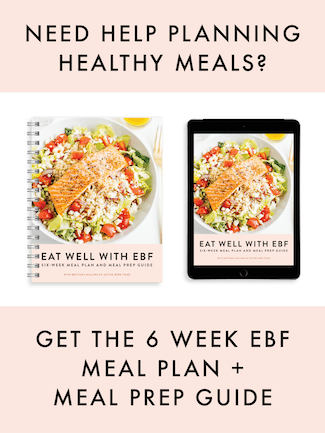 I can see myself keeping this salad on hand over the summer to have an easy side dish ready to go with grilled protein like my apple cider vinegar chicken or this easy baked falafel. Israeli salad appears super simple and it is! But the flavors work together in such a great way, it’s almost like this dish has layers. The key to flavor consistency is to dicing the tomatoes and cucumbers to a similar size. I love using cherry tomatoes and English cucumbers because you can easily chop them the right size and each piece has some skin which helps the cucumber and tomato hold its shape. Once you have all of your vegetables prepped, just add the herbs, a little lemon juice, olive oil and sea salt. Mix everything together and you’re ready to serve! SO EASY! Random question for you: when you chop herbs do you use a knife? Kitchen scissors? Herb scissors? I typically just use a knife and never thought about the other options until some friends brought it up. A whole new world of herb chopping! 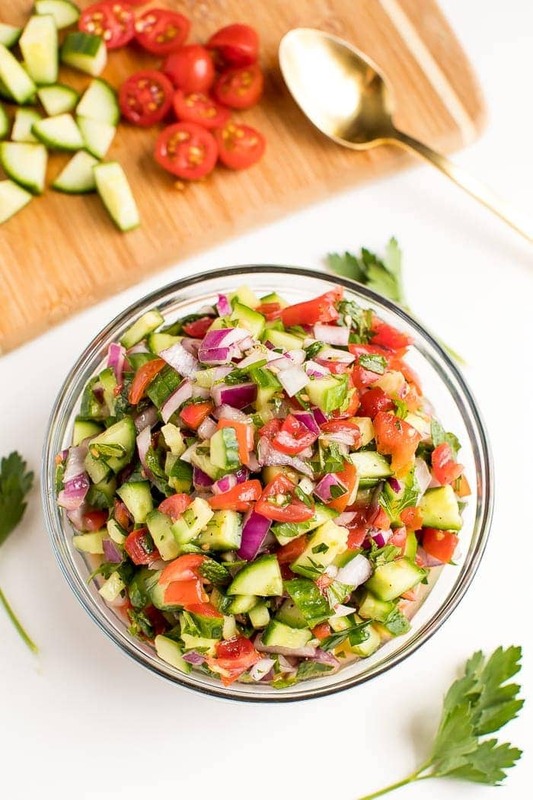 A simple tomato cucumber salad with fresh herbs and a light dressing. It’s the perfect summer side salad to pair with your favorite protein. 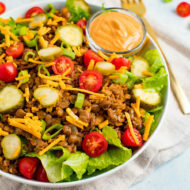 Combine all ingredients together in a large bowl. Season with salt to taste. Refrigerate until ready to serve. 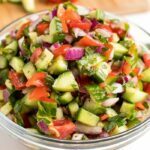 If you try this Israeli salad recipe I’d love to hear what you think. Please leave me a comment and give the recipe a star rating! How much onion goes in this? 1/4 cup diced or finely chopped! The pictures look like they have red onion in them, but it’s not in the recipie. Do you need red onion or is it as good without? Is there red onion in this recipe? What is a good salad dressing for this salad for people who cant do lemon/vinegar? What about just using a garlic olive oil dressing? Or a cucumber yogurt dressing? I think either would work great. Why do you avoid lemon/vinegar? Just curious! I have never heard of an herb scissors! Now I’m intrigued 🙂 This recipe is perfect for summer garden produce! I had WAY more cucumbers and tomatoes last year than I knew what to do with! Add the dressing and salt right before serving to maintain freshness. Not everyone likes it with mint. I would make it optional. I love this salad but leave out the pepper because of allergies. Don’t add the salt until just before serving otherwise it brings out the liquid and the tomatoes lose taste and shape and become limp. Also if you’re making enough to last for lunch the next day – don’t add the dressing until serving – keep it separate.